In order to cater diverse requirements of the clients, we offer our clients an extensive range of Pig Repellent that is natural ingredient and is environment friendly in nature. It contains the natural ingredients that are safe in usage. Our entire product range is quality assured and is delivered in varied capacities. 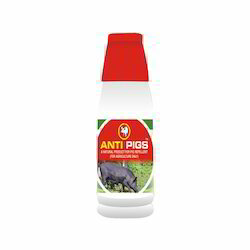 ANTI-PIGS is a natural product for repelling pigs without killing them. Looking for Pig Repellent ?